Enter the Winnipeg Jets Unveiling PoolWith each passing day, is the lack of a Winnipeg Jets logo and uniform killing you? Icethetics has the solution! 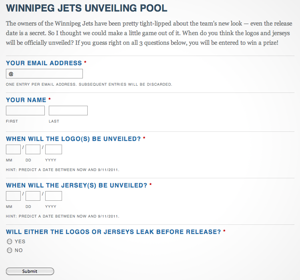 Correctly guess the unveiling dates (and whether or not there will be leak), enter the Winnipeg Jets Unveiling Pool and turn your misery into a chance to win a small prize! Play the Winnipeg Jets Unveiling Pool! 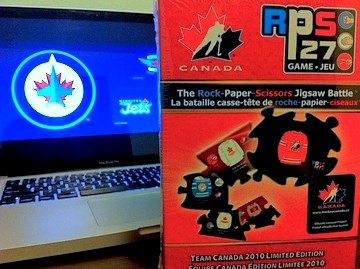 All the details about how to play (and how to win) can be found on the Jets Pool page. Be sure to note that once any official dates are announced or the official unveilings or unauthorized leaks occur, the game will immediately close and no more entries will be accepted. The game page also has details on the prize. Look, I know it's not much but at least there is a prize, right? Hope you guys have some fun with this! Jets Pool prize (MacBook not included)In order to win, you have to answer all three questions correctly. We have answers to the first one only at this point. The logos were obviously unveiled today, July 22. And technically, there has not yet been a leak. The rules of the pool state that a leak of the logos or jerseys must occur at least 24 hours prior to the official unveiling. In the case of the logos, the leak was the same day. Whether the jerseys are leaked remains to be seen. If you answered "July 22" for the logos, you're still in it. We began with 1,007 eligible entries and after eliminating those that predicted a date other than 7/22/11, were left with just 25! However, I also thought it prudent to eliminate anyone who predicted a jersey unveiling date on or before today's date. We now have just 15 entries still in contention! And all but three of them predicted there will be a leak of some kind. By the way, I can't believe how many of you entered your birthdates in the logo unveiling date form. You guys are willing to give up way too much information to the Internet without actually reading first. You should be more careful. I know it's just a birthdate, but what's next? Social Security numbers? Just saying. A couple of you have asked to see a list of who's still in the competition. First names and last initials along with the predicted date for the jersey unveiling, listed below. Good luck to the 15 of you!